These are accurate waterline models of the standard barge for the Mississippi River system, measuring 195′ long and 35′ wide. I used engineering drawings to accurately model the dimensions and placement of the hold, and details such as the winches, bitts, ventilators, and exterior bracing around the coaming. Freeboard (height above water) is a scale 4.5′; coamings are a scale 3.5′ high. In N scale, the barge is 380 mm (15″) long, and 68 mm (2.7″) wide. In Z scale, the barge is 277 mm (10.9″) long and 50 mm (1.9″) wide. The Z scale barge could serve as a smaller N scale barge; in N scale it measures 142′ long by 25.5′ wide. 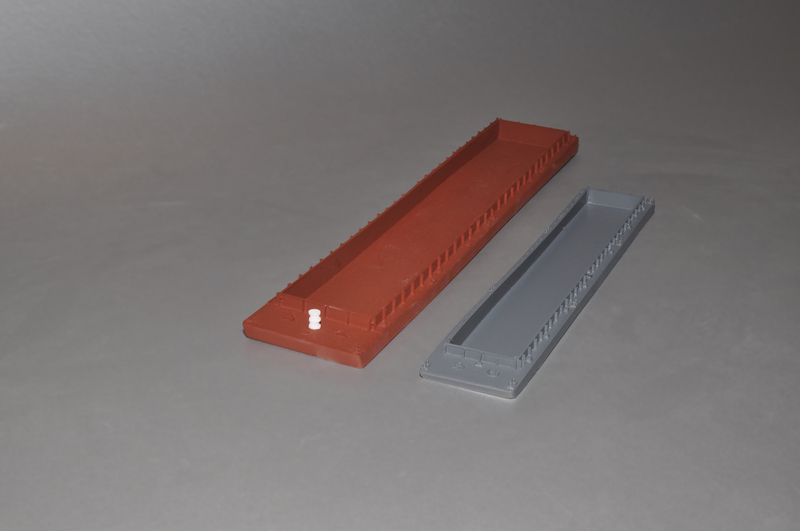 The N scale barge is primed in red chromate primer; the Z scale barge in gray primer. Unpainted models are available, as are models without mooring bitts attached. Availability in very limited until March 2014. Price is $60 each for N and Z. Discounts are available for multiple orders: 10% for three to nine; 15% for ten or more. Upcoming for river modelers is a “Jeffboat”: a 145′ towboat from Jeffersonville Shipyards, the second largest supplier of barges and inland waterway vessels, and a smaller towboat (they are actually pushers) of about 75′ in length. 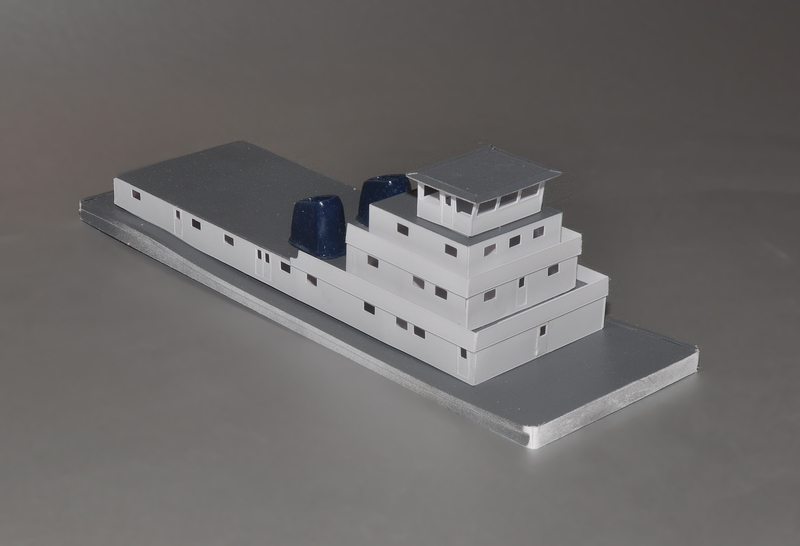 Here’s the feasibility model of the Jeffboat, without the smoothed corners or deck details. Contact peterknolan@gmail.com to order or for more information.